Because safety is at top priority at Green Summer Campaigns, the following describes the steps we take to ensure our trips are safe and injury free. Students are required to wear proper shoes when working at community project sites, especially when using heavy equipment. (Please see the picture on the right). 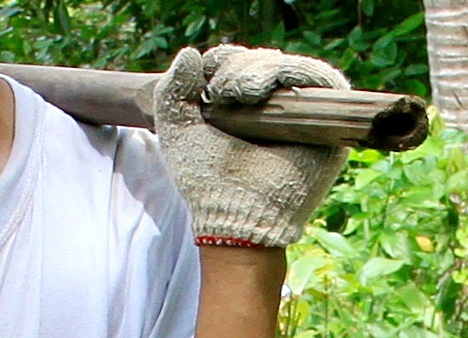 The use of woolen gloves and helmets are advised, and sometimes required based on the project. We provide gloves and helmets and students should bring their own footwear. When evaluating potential community service project sites, we carefully consider what resources are available in the event an evacuation is necessary. We only choose sites where hospitals and health care centers are nearby, and map how quickly we can arrive there. Chaperons and teachers will be provided a copy of these arrangements upon arrival. Students must complete a form requesting basic health condition, which includes allergies and food preferences. Other health and safety considerations. Life jackets on boats: We often have boat trips along rivers and we always have life jackets on board. Students are advised to bring plenty of insect repellent. Green Summers provides luggage name tags and identification information to our front office so that any student can be located at any time.